Which are the best calligraphy nibs for beginners? If you are a cartoonist, artist or calligraphist, pen selection is one of the most the most important elements. If you are Ebeneezer Scrooge and make purchases based purely on cost then save yourself some time and don’t bother reading the rest of this article. Great artwork without equally great lettering looks tacky, poorly executed and amateurish. You can, of course, use digital lettering. There is a vast selection of fonts available to suit any lettering job you can think of. If you want your own style of lettering there are two options. Either create your own font that can be digitized or hand draw your font with a pen. I prefer the latter but have looked at digitizing my own font designs as another option. I have looked for five of the most highly rated calligraphy pen sets to help you in your quest for perfect lettering. I have also road tested each one and the review is based on my opinion and Amazon customer ratings. There are different brands, sizes and types of calligraphy nibs. A set of calligraphy pens gives you scope to try the variation in size to produce different styles of lettering. The following calligraphy sets have some of the best nibs for modern calligraphy without breaking the bank! This is my favorite and personal choice for lettering. 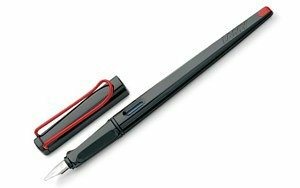 Although the finish from the pen is superb the Lamy calligraphy pen has one massive advantage over other brands – its shape. The ergonomic design is the best I have found for comfort and grip. It is one of the few pens that makes you feel as if the pen is part of you. This is why most of my personal pens and retractable pencils are from the Lamy range. My Lamy Calligraphy 1.1mm nib pen is always with me. 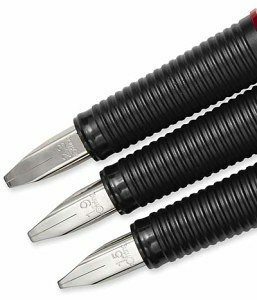 The set consists of the lengthy screw on tapered barrel with push fit cap which has a really well-designed clip to secure the pen in your pocket. There three interchangeable nibs 1.1, 1.5 and 1.9mm – the smaller nib allows for general writing and as a fountain pen, the Lamy is a sheer joy! There is a pack of 5 Lamy ink cartridges plus a guide booklet for the set which are housed in a secure and stylish metal box which is great for transporting and also makes a great gift set. One of the best calligraphy pens on the market! This is also a superb pen which I use regularly. Very stylish with a good feel and grip in the hand. Backed up by the quality of the Rotring brand. The pen has great balance with its quill shape and comes with three calligraphy nibs 1.5, 1.9 and 2.3mm. A great range of Calligraphy width. I also use the larger nib for filling in larger areas of block color in cartoon work rather than a brush as it gives a greater degree of accuracy. The pen top is push fit with a secure clip that won’t let you down when you need to secure the pen in your pocket. The set comes with 6 rotting ink cartridges – one of the best inks on the market. The only disadvantage I have found with the Rotring Artpen is that the ink cartridges are relatively small compared to the Lamy (above). 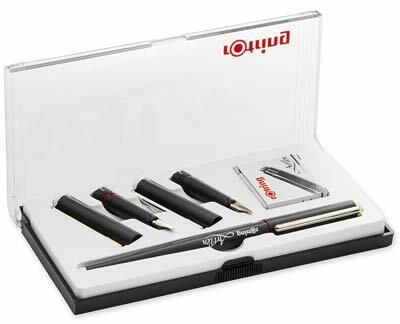 A superb calligraphy set that is housed in a stylish presentation box – great portability and an ideal gift set. This is a basic set of six interchangeable calligraphy nibs (c1, c2, c3, c4, 100 and 152 sizes) that comes in a bundle with a 9″ x 12″ US Art Supply calligraphy paper pad. This is a great set for the absolute beginner to try out calligraphy. And is the best way to go before venturing into some of the higher priced (and integral ‘with cartridge’) models. The paper pad includes printed Practice Rule and Slanted Grid. Please note that the speedball pen is a ‘dip pen’. This has to be dipped into an ink supply and has no internal cartridge. An additional bottle of ink is required (ink not included in the set). If you don’t require the bundled calligraphy paper pad there is the option to purchase the calligraphy set on its own. I found this to be a pretty good pen which draws smoothly and accurately. The downside to me is that I don’t particularly like dip pens for general use. They have their place for specific cartooning effects but I prefer a cartridge or refillable pen. You may disagree as it’s horses for courses. A great highly rated dip pen and perfect if you want to know how to learn calligraphy economically! Quite a substantial set with 4 pens, 5 nibs (extra fine, fine, medium, broad, extra broad) and a range of 20 different colored inks 5 blue, 5 black, 2 yellow, 2 orange, 2 pink, 2 green and 2 brown. There is also a practice pad and instruction book. The whole set comes in a really nice compact metal box which makes it an appealing gift. I found the drawing experience to be very good on the whole but the consistency of line width was not always as accurate as the Lamy or Rotring pens. If you are looking for a high-end calligraphy set this may not be for you. If you are looking for a beginners set with good quality nibs and lots of color choice this may be just for you. Not in the same league as the Rotring or Lamy pens but really good value. Another substantial calligraphy pen set. This has three ‘fountain style’ pens, 3 nib sizes (fine, medium, broad) and a variety of 14 Skrip cartridges. There is also an aerometric converter which allows you to use your own ink supply if you wish. This is a nice little kit and found the nibs to give a nice even ink flow and were very accurate. 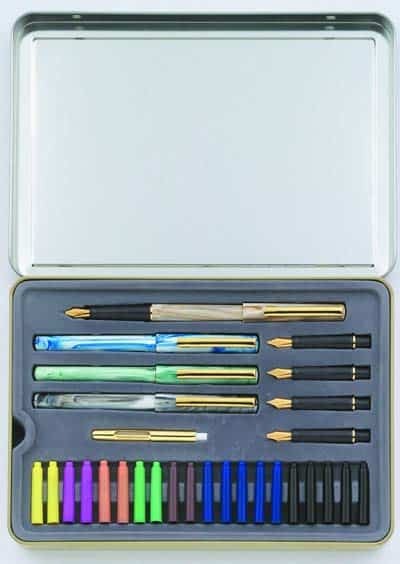 I would give this set the edge over the Staedler set as I found the pens more smooth and responsive. The set also comes with an instruction manual with step by step guidance. This is another ideal starter kit and also very good value for money. The attractive pens each have their own individual viewing panel to allow you to monitor the ink level. The only downside is there is no box supplied to store the pens. Which is the best-recommended pen set to write calligraphy fonts? 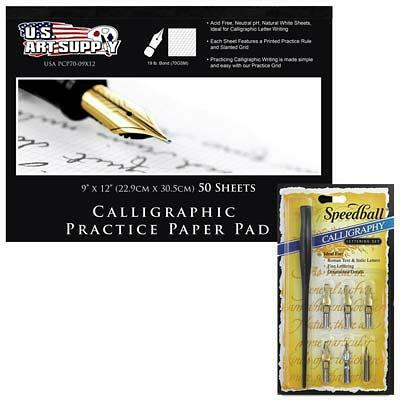 If you are looking how to learn calligraphy and just want to dabble before buying a more professional set we would advise the basic Speedball 6 nib calligraphy set with optional 9″x12″ Calligraphy Paper Pad. 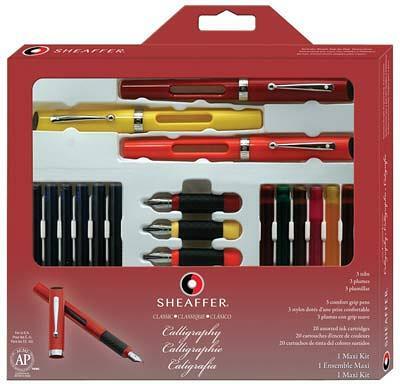 If you are looking for a more comprehensive set for a beginner then either the Shaeffer or Staedler set could be the right choice. The Shaeffer has a slightly higher 4-star rating on Amazon and after using the pens I can see why. The Rotring Art Pen calligraphy set is an excellent quality set that won’t disappoint. Not only does it draw really well but looks sleek and stylish. As stated previously the only downside is that Rotring ink cartridges are relatively smaller than some others (such as the Lamy brand). A minor point but may come into play if you are a very productive artist. 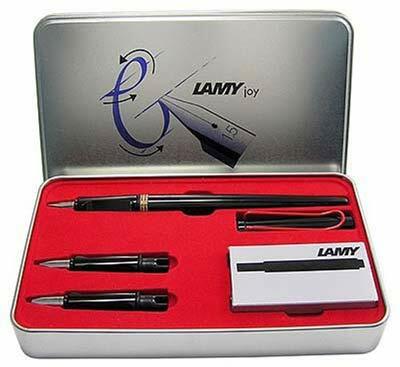 However, for someone who really wants a quality pen that feels superb in hand, there is a clear choice with the Lamy set. I have used this for several years and it is, without doubt, the best on the market. It feels great in hand – even in prolonged use and draws smoothly and with precision. The Lamy brand continues to shine above the rest in my opinion. 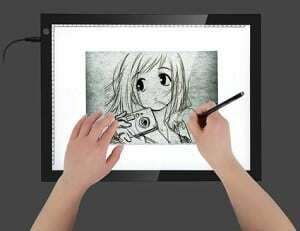 Have you ever considered a lightbox?